Hi Aspirants..Here is the Daily Current Affairs Updates for 29 January 2016. 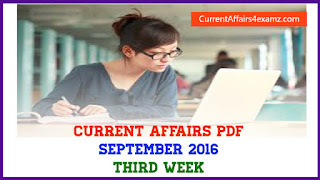 This points will be useful for upcoming LIC AAO 2016, ISRO Assistant 2016, Railway RRB 2016 exams etc. 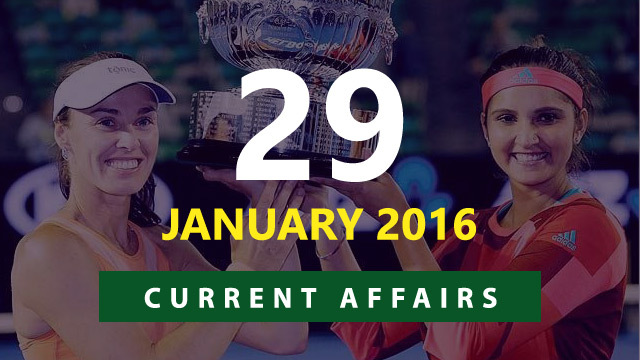 --> Indian tennis ace Sania Mirza and her Swiss partner Martina Hingis beat seventh seeded Czech combination of Andrea Hlavackova and Lucie Hradecka to win Australian Open women's doubles title 2016 on 29 January 2016. --> Top seeds Sania and Martina, who are on a record winning streak, continued to rule the roost as they defeated the Czech pair 7-6, 6-3 at the Rod Laver Arena. --> This is the third successive Grand Slam doubles title victory for Sania and Martina and their maiden Australian Open title as a pair adding to their Wimbledon and US Open title victories in 2015. --> President Pranab Mukherjee and Prime Minister Narendra Modi lead the nation in Beating the Retreat celebrations at historic Vijay Chowk in New Delhi on 29 January 2016. --> This marks the culmination of the four-day-long Republic Day celebrations. --> For the first time bands from the Delhi Police and Central Armed Police Force were played at the ceremony. --> Union Ministry of Urban Development has shortlisted 20 cities from 11 States and Delhi Union Territory in the list of first batch of Smart Cities Mission. --> These shortlisted cities were selected from Smart City Challenge competition in which 97 cities and towns had participated from 23 States and UTs. --> A smart city is highly advanced urban region in terms of overall infrastructure, communications, sustainable real estate and market viability. --> Gurdeep Singh has been appointed as the Chairman and Managing Director (CMD) of National Thermal Power Corporation (NTPC) Limited. --> His appointment was confirmed by Appointments Committee of the Cabinet (ACC), headed by Prime Minister Narendra Modi. --> Micro blogging site Twitter has appointed Leslie Berland as its Chief Marketing Officer (CMO) of the company. --> Prior to this appointment, she was working at American Express (AmEx) as executive vice-president of global advertising, marketing and digital partnerships. --> Indigenously-built surface-to-air Akash missile was successfully test fired from complex-3 of the Integrated Test Range (ITR) at Chandipuri in Odisha. --> India has overtaken Thailand as the world’s largest rice exporter in the year 2015 by shipping (exporting) 10.23 million tonnes of rice. --> It was announced by the Bangkok based Thai Rice Exporters Association Chairman Charoen Laodhammatas.